A little over a year ago, I bought an early-1970's era house whose original owners had recently passed away. At the closing, one of the sons told me that his dad wasn't much of a woodworker (as evidenced by wood filler everywhere; the phrase "I cut it twice and it's still too short" comes to mind). Based on the electrical work I've found while doing my own upgrades, the son should also have mentioned that his dad wasn't much of an electrician either. Example 1 (photos attached). 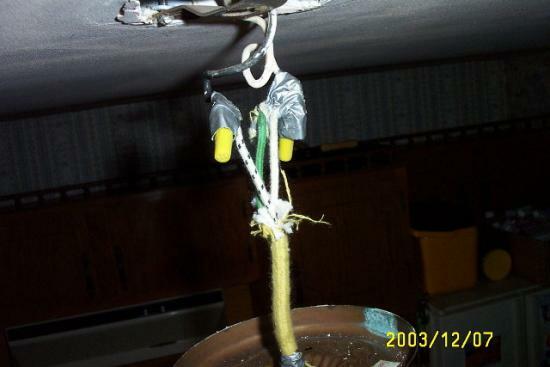 In the kitchen, the ceiling mounted light had duct tape wrapped around the wire nuts, AND the green and white wires from the light were wire nutted to the white in the box. 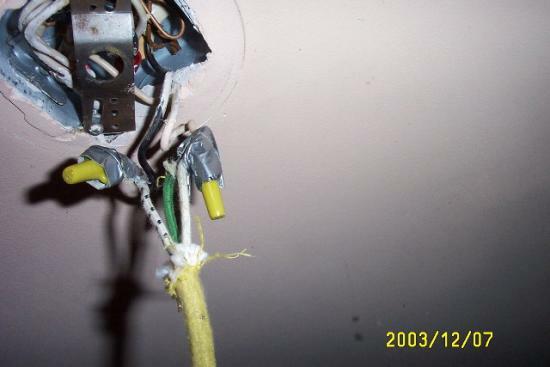 I guess he didn't know the green wire was supposed to connect to the bare wire in the box. Example 2. It's a split-level house, originally with a garage on the lower level, with the garage convered into a family room not long after the house was built. The electrical boxes were installed even with the framing, which means every light and outlet box is flush with the BACK SIDE of the drywall. He added wood paneling on top of that, so extra long screws are needed to attach faceplates. Of course, the actual outlet is almost an inch behind the faceplate. 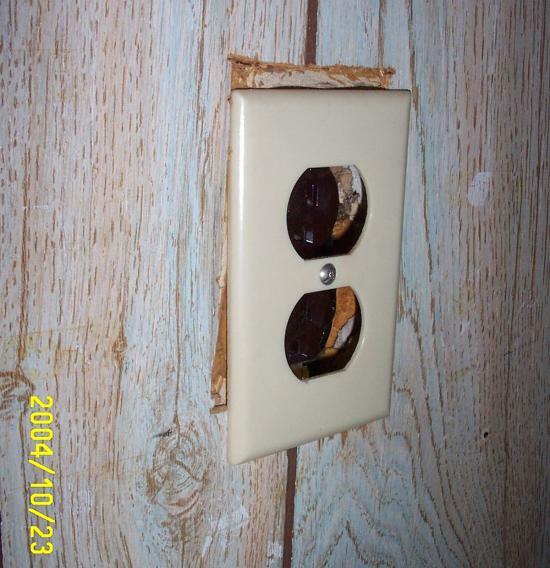 To be fair, I added the faceplate to the outlet in the picture; there wasn't one before. Example 3. The pool has a 240 volt 1.5 HP pump, with each leg protected by 20A GFCI breakers in the panel. Next to the pool pump is an electrical outlet wired into one leg. To provide electricity to a couple of outdoor sheds located on the property, the previous owner ran shallow-buried 12-2 UF from the sheds to the pool, and terminated the cables on plugs wrapped with electrical tape. 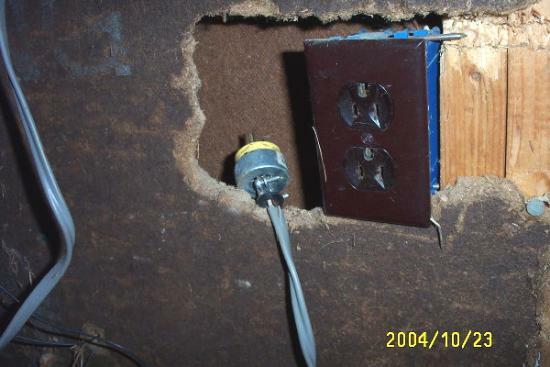 The second photo shows an outlet box in the farthest shed, which is 150' from the house. 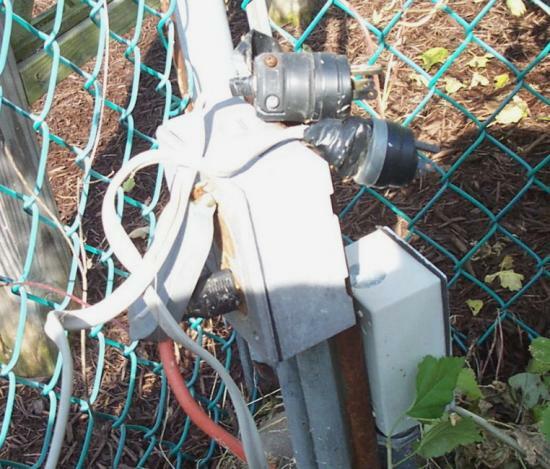 The plug visible in the picture is the "disconnect" for a submersible pump in a nearby 20' diameter shallow pond with fountains. I haven't bothered checking, but judging by the water flow my guess is that it's at least 1/2 HP pump. And judging by how warm the cord in the shed gets when it's running, it may even be a 3/4 HP pump. I guess the phrase "voltage drop" didn't mean anything to him. Just goes to show that a little bit of knowledge... .
First thing I'd be checking, is what's inside the Panel. the green and white wires from the light were wire nutted to the white in the box. Trumpy: First thing I'd do is pull all those ugly plugs and shut off everything I don't always need until rewiring the place... and kill all breakers except the one for the refigerator before leaving the house! The NM-type cable into a cordcap for an extension is all too familiar. FWIW, that looks like UF cable. Texas_Ranger: It's actually 'country wiring', not ghetto. The zoning out here is agricultural. I believe I've isolated the electrical problems, including the 2 circuits in the basement sharing a common neutral. I did make sure to have those 2 circuits (even if they're seldom used) on different phases when I moved the household circuits to a 100A subpanel. I left the baseboard heat, air conditioning, dryer, stove, pump, and pool on the old panel. Trumpy: Here's some more pics. The first two show the panel and the surrounding area, which is crowded with water tank, water softener and 80 gallon water heater. The short container holds 240 pounds of salt pellets for the water softener so it's a pain to move around. The third shows the panel shortly after I moved in. Most of this floor is below grade, and on the other side of the wall (behind the plumbing equipment) is a bathroom and laundry room. The previous owners vented the dryer indoors, so I believe the combination of high humidity from the dryer and salt air caused the rust on the panel because there's no rust inside the panel. You can also see the discoloration on some of the plumbing. I'm a network installer, so I wasn't too pleased at seeing phone lines running parallel to the panel. The phone and electric lines were even sharing the same holes running through the floor joists overhead. The telephone NIC was originally "mounted" just below the outlet and held by 1 screw. I moved all of that to the board you see at knee height and added the ground bus. Another puzzling item: The ceilings are 8', and the foyer and hallway lights were this kind, and they hung down to just under 6'.